Ripley’s Haunted Adventure in Gatlinburg puts on its special “Fright Nights” weekends again for its 18th year in 2016, every Friday through Sunday all through October. It’s that time of year when ghosts and goblins set the stage for Gatlinburg Halloween antics. If you’d like to experience exploring spooky places, getting up-close to scary faces, and hearing bloodcurdling screams, make your plans to share in the frightening atmosphere offered at the Haunted Adventure on Parkway. When you enter the door, be prepared for chills and shrills, many of which will be your own, as you come face to face with fearful characters. Each devilish demon has a main focus on surprising you when you least expect it. You never know where one will show up. It may be at every turn, behind any door, around the corner, or maybe one will be hidden away in a secluded nook, ready to pounce as you walk by. 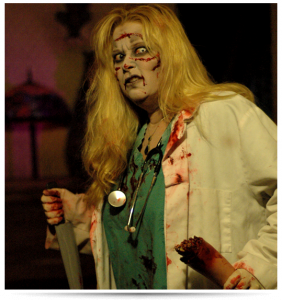 The creepy Ripley mansion comes alive – with “undead” activity – as creatures of the night roam the halls and rooms. Each creature has its own agenda about what to do to with you to make your visit to its haunted home a howling good time during the Fright Nights event. To keep your sanity intact, don’t come alone to this Gatlinburg Halloween-like adventure. During Fright Nights, Ripley’s increases the number of characters on the prowl. And the Haunted Adventure has added many special shocks to its ultra-creepy mansion. This year’s theme will have you looking over your shoulder every minute as you walk down “Movie Monster Madness” memory lane. Travel through the madness and mayhem of the silver screen’s manic monsters, and encounter a variety of “stars”, from classic fiends to contemporary creatures. Expect blood-sucking vampires, stiff-walking mummies, and faceless and deranged monsters! Hair-raising special effects and lifelike animatronics await your pleasure at this state-of-the-art Ripley’s Haunted Adventure. Just climb aboard the coffin cage that takes you to the top of the mansion then, oh so carefully, find your way back out with a little, or a lot, of help from the undead residents lurking along the way. Children must be at least 6 years old to pass through the creaking door of the Haunted Adventure mansion, and children ages 12 and under must be in the company of an adult. The festivities begin at 6 p.m. when the cast of ghoulish characters goes on parade. Single and combo tickets are available at the door. For extra savings, discounted tickets are available online at the Ripley’s Haunted Adventure website.